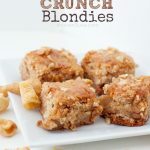 I signed up to participate in a blogger cookie swap, and was excited to try out a recipe I’d had in my head for a while. Can one consider a blondie a cookie? In this case, I did. I had seen recipes for sweets including potato chips, and I love salty pretzels in my treats, so why not include one of my most favorite crunchy treats–Caramel Bugles? These things are a slice of crunchy heaven, I tell ya. I first discovered them last March when my mom brought them along on our Disney World road trip adventure. 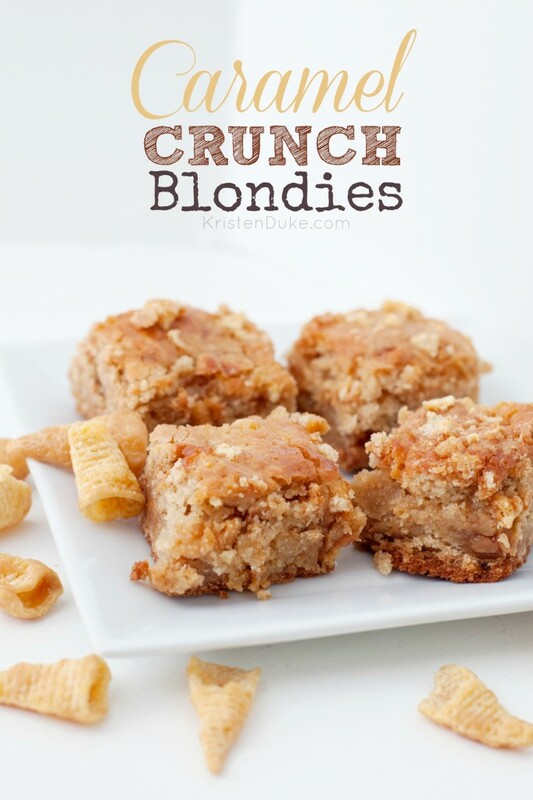 So I thought I’d throw them into a blondie recipe. I got the base of the bar from my friend Joceyln’s site, Inside BruCrew Life, from her Congo Bars. I made them once before, and they were so moist and delicious. But I had a little mishap the day I made these, and they got SLIGHTLY overcooked. I wouldn’t even share these today if I didn’t HAVE to on account of the cookie swap and my promise to share, so look at Jocelyn’s recipe above if you want to know how moist they are SUPPOSED to be! Combine first 7 ingredients mixing wet first, then adding dry. Spread half of the dough onto 9x13 greased baking dish. Sprinkle with half of caramel bits and half of Caramel bugles. Drop spoonfuls of remaining dough on top. Sprinkle with more caramel bits and bugle bits. Pour can of sweetened condensed milk on top of all. 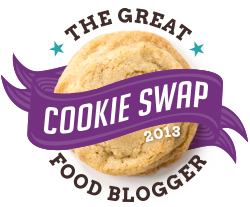 I was excited to participate in the Great Cookie Swap, and get to know a few others bloggers better. The cookie swap also benefitted Cookies’ for Kids Cancer and raised $13k!! I sent to 3, and 3 sent to me! Well, actually just 2, one had a family crisis come up, hopefully I’ll get them late! The first package I got from the Curious Cuisiniere, Sarah, and she sent Chocolate Peppermint Biscotti! Then I got some peppermint hot cocoa cookies from Karen at In the Kitchen with KP. The Lean Green Bean and The Divine Miss Mommy and Cupcake and Bacon If you’d like to see ALL of the cookies and participates in this great cookie swap, head HERE. If you are a blogger that shares at least 2 food recipes each month, and want to be a part of this next year, subscribe for notifications HERE.